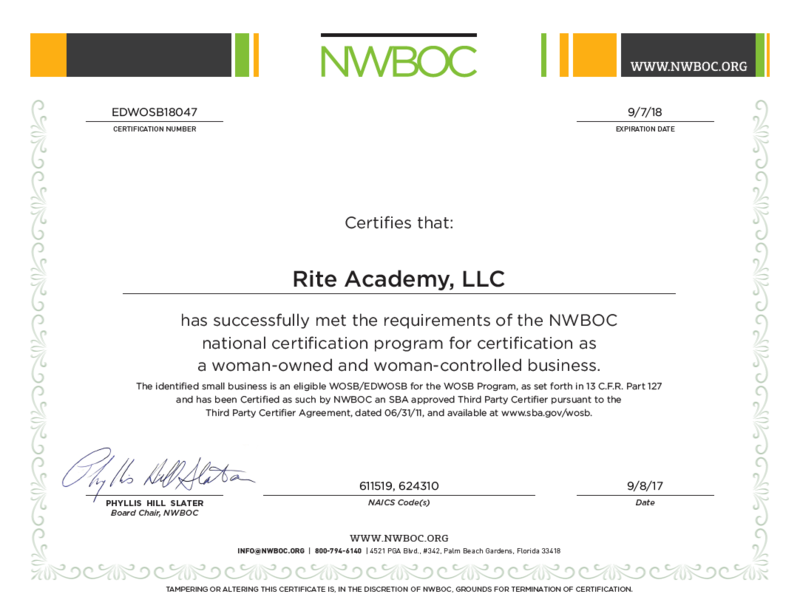 RITE Academy is a women owned and operated company, providing the latest and most innovative training program called “Racial Intelligence.” This is the only diversity and inclusion program that includes Emotional and Social Intelligence techniques, that benefits the individual and the company. Providing first class training for Executive leadership, Performance management, Mindfulness, Safety, Risk management, Title IX programs and Universities, Bias-Free Workplace Harassment Training and consulting services. See Attachment for more information on courses provided. Learning to treat ourselves fairly, with an understanding of our implicit bias and internal communication, must be in place before we can treat others fairly. Title IX was put in place to create a fair and safe environment on campus, for everyone. 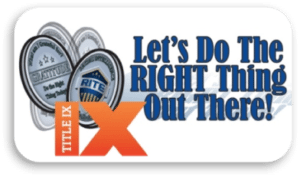 RITE is thrilled to join the Title IX cause, helping everyone on campus… Do the Right Thing! As an employer, you need to remain competitive. When groups look to leave, this harms morale and productivity. 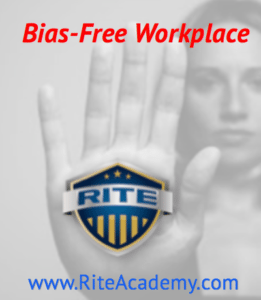 RITE Training keeps your employees engaged, happy, and productive. 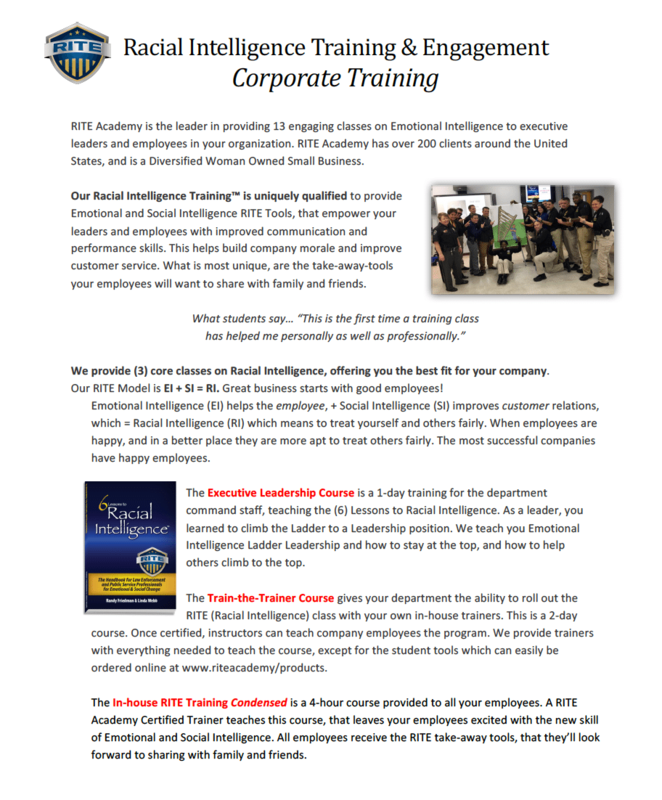 Our Racial Intelligence Training™ is uniquely qualified to provide Emotional and Social Intelligence RITE Tools, that empower your leaders and employees with improved communication and performance skills. This helps build company morale and improve customer service. What is most unique, are the take-away-tools your employees will want to share with family and friends. We can specifically design a course that is relevant to strengths, and weaknesses that have been identified within your organization. 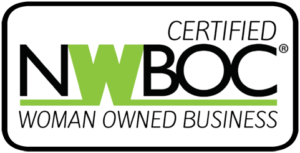 We are easy to work with, and a specifically designed training course to fit your needs is something our organization is happy to provide. We take pride in making sure students have take-away tools after the course, because we want your participants to utilize what they have learned at work, as well as at home. We believe in employee wellness and career resiliency. Successful training means we are helping not only the organization, but also helping the individual participant and the customers for which they serve. We have well over 200 clients, 25,000 student participants and 2000 executive leaders have taken our courses showing proven results, and also making cultural changes within the organization while improving performance. 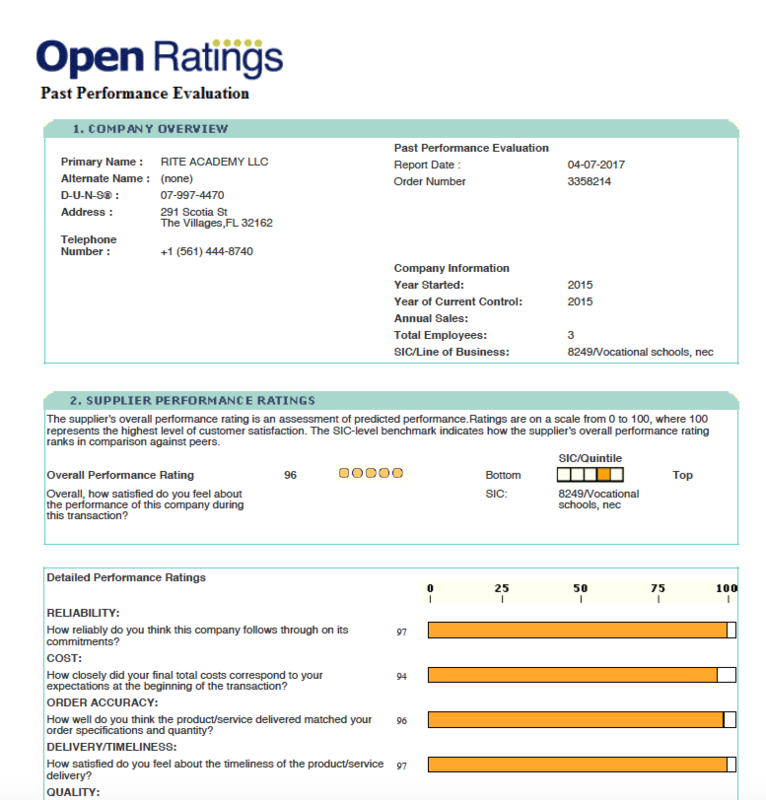 We received a 96% past performance OPEN RATINGS by DUN and BRAD on our courses, showing that once our clients receive our course that they are happy with entire business process that RITE Academy provided. We work with corporations, public service entities, military, government, and non-profits. We are ready to help your companies training needs. 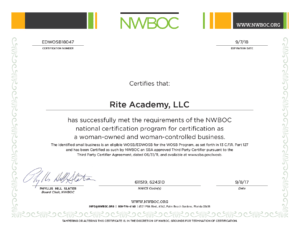 See FAQ Page for W9, References, Testimonials, and list of courses available. 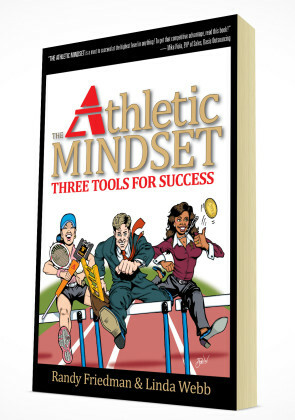 Learn how to improve your employees performance while helping them improve in personal ways. 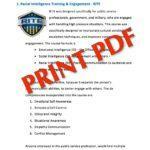 Emotional Intelligence (EI – The Person) + Social Intelligence (SI – Others) = Racial Intelligence. Racial Intelligence means to treat yourself and others fairly. 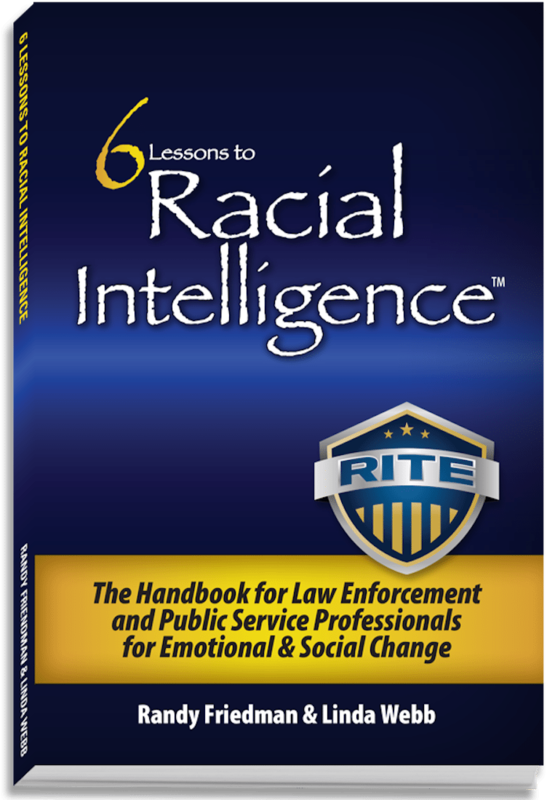 The 6 Lessons to Racial Intelligence is for all public service professionals, Government, Military & Corporate employees. This first quote of many we used in The Athletic Mindset, is the essence behind every great athlete, successful CEO, brave soldier, and proud mother. 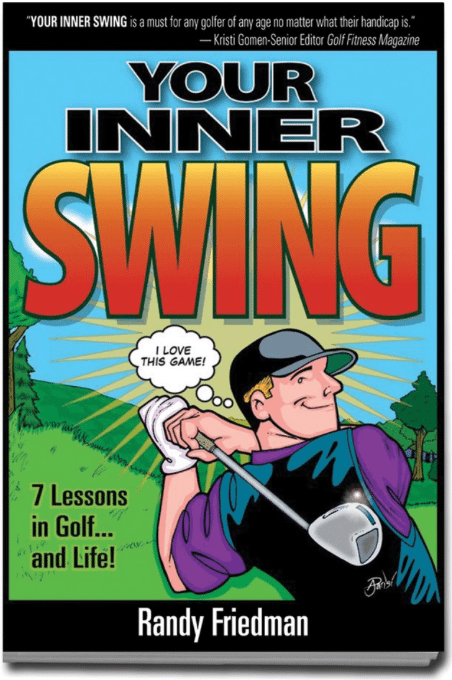 “Most golf mental books only deal with the anxieties and fears that only occur on the golf course, but most of us know that our old crippling baggage we carry from our personal and professional lives follow us to the golf course and affect how we play.